Latest SSC Constable GD Exam Notification 2018 – Staff Selection Commission (SSC) published notification for recruitment of Constable (General Duty) in Central Armed Police Forces (CAPFs). SSC announced 54953 vacancies in CAPFs like Border Security Force (BSF), Central Industrial Security Force (CISF), Central Reserve Police Force (CRPF), Indo Tibetan Border Police (ITBP), Sashastra Seema Bal (SSB), National Investigation Agency (NIA), Secretariat Security Force (SSF) and Rifleman (General Duty) in Assam Rifles. Eligible candidates may apply online for the Constable GD Recruitment 2018 at SSC website. Latest Update:- Candidates who have not submitted Contact details, Photograph, Signature and thumb impression properly in One Time Registration form can modify now. SSC give a chance to modify these things from October 11, 2018 (11.10.2018) to October 18, 2018 (18.10.2018). Candidates are requested to make changes by login to SSC website and select “Modify Registration”. Find the link to modify registration at the table shown below. Before apply for the recruitment, candidates should ensure that they fulfil the eligibility criteria given in the recruitment notification. Also be aware of exam scheme, exam syllabus, exam centres, selection process and application process from the advertisement. Candidates can’t register online after the stipulated date. So, submit the online application on or before the last date. The Last date for the submission of the online application has been extended to 30.09.2018. Matriculation/ 10th Standard from a recognized institute. No fee for Women/ SC/ ST/ Ex-Servicemen candidates. Logon to SSC website and then locate Notices>> Constable-GD. Find notification for Constable (GD) in Central Armed Police Forces (CAPFs). For more details regarding SSC Constable GD Exam Notification 2018 logon to ssc.nic.in. The information given above is based on SSC Constable General Duty official advertisement. 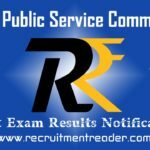 Find upcoming SSC Exam Notifications @ Recruitment Reader.